With 2017 finished, and Ryzen being very successful for AMD, the inevitable question was due: what happens next? Early in 2018, the plans were laid bare: a second generation Ryzen processor was set to come in mid-year, followed by a second generation Threadripper, using GlobalFoundries’ 12nm process. This is not AMD’s next big microarchitecture, which we know is called Zen 2 on 7nm, but an opportunity to launch a wave of components with minor improvements and take advantage of a manufacturing process that gives more frequency and more performance. Today AMD is launching four CPUs, and we have tested them all. (4/21) Some of our results, initially thought due to Spectre/Meltdown patches, were not in line with others. Testing audit was started. (4/25) Our extensive internal audit showed reasons for the differences, as documented in detail in this follow-up article. In short, an issue with a non-standard use timers on Windows was causing the performance of both AMD and Intel processors to dip, particularly impacting the latter. (5/2) Benchmark results have been updated. (5/22) X470 Motherboard. StoreMI, and Power Analysis pages updated. (5/26) Conclusion Updated, Performance Per Dollar graphs added. 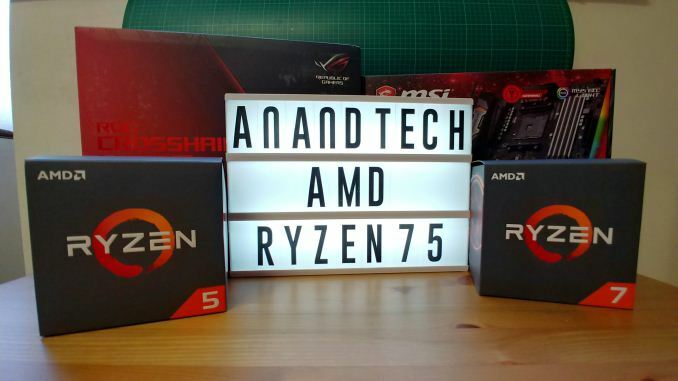 For readers that only want one piece of information, this is it: AMD is launching the Ryzen 7 2700X, the Ryzen 7 2700, the Ryzen 5 2600X, and the Ryzen 5 2600. The Ryzen 7 2700X takes over the top spot from the Ryzen 7 1800X, and for an extra 10 W in TDP will provide a base frequency of 3.7 GHz and a turbo frequency of 4.3 GHz on its eight cores, with simultaneous multi-threading. This is an extra +100 MHz and +300 MHz respectively, going above the average limits of the 1800X when overclocked. The 2700X also reduces the top cost for the best AM4 Ryzen processor: when launched, the 1800X was set at $499, without a bundled cooler, and was recently dropped to $349 as a price-competitor to Intel’s most powerful mainstream processor. The 2700X undercuts both, by being listed at a suggested e-tail price of $329, and is bundled with the best stock cooler in the business: AMD’s Wraith Prism RGB. AMD is attempting to hit all the targets: aggressive pricing, top performance, and best value, all in one go. The Ryzen 5 2600X is the six-core option, also with an aggressive frequency strategy: 3.6 GHz base and 4.2 GHz turbo. At a 95W TDP and a suggested retail price of $229, it comes bundled with AMD’s Wraith Spire cooler, which again is an impressive stock cooler. The Ryzen 7 2700 and Ryzen 5 2600 are the 65W versions of the X counterparts, offering near-similar frequencies for $30 less. All the CPUs will support dual-channel DDR4-2933 memory, up from the DDR4-2666 memory support of the 2017 Ryzen processors. 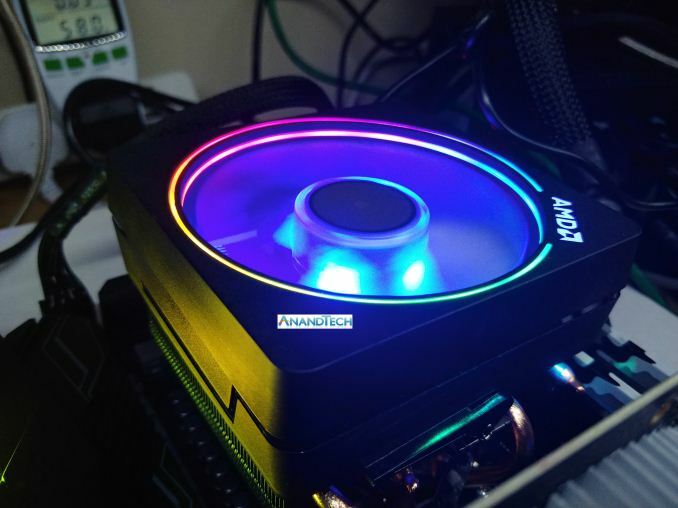 One of the big changes is that now every processor comes with a bundled stock cooler, ranging from the Silent 65W Stealth models up to the big Prism RGB, all of which are easily sufficient for good turbo performance. At the top, the 2700X takes over from both the 1700X and 1800X. Rather than having three Ryzen 7 CPUs in the market for this generation, AMD examined its product line and opted on two, perhaps based on sales figures. As seen in this review, the 2700X is already pushing the silicon process to the limit, so there is not much headroom to go above this product for a new model in the future. The full list ends up being a mix of Ryzen 2000-series CPUs (the new ones), Ryzen 2000-series APUs, and a pair of Ryzen 1000-series. We already examined the APUs in great detail in the past few weeks, showing that they directly replaced some of the original first-generation parts very easily. So far the four new 2000-series will sit at the top of the pile, however AMD’s strategy is often to drip feed its new parts, so we might see some more 2000-series as time goes on. No launch is complete without talking about the features. AMD is using GlobalFoundries’ 12nm manufacturing process which has obvious on-paper benefits, however there are a number of internal firmware adjustments to touch upon, updated features and roles for AMD’s Precision Boost and XFR technologies that can have direct impacts on performance, a new chipset (along with 30+ motherboards) to run alongside the current offerings, and also new/renamed features such StoreMI. We also want to examine how these new products fit into AMD’s longer term plans and whether they are on track. We’ll cover these in the next few pages, as well as the results from our testing. As part of today’s launch, AMD went into extensive benchmarking detail about its new chips. It was abundantly clear from the data provided that these new processors are aimed squarely at Intel’s most recent mainstream processors: Coffee Lake. 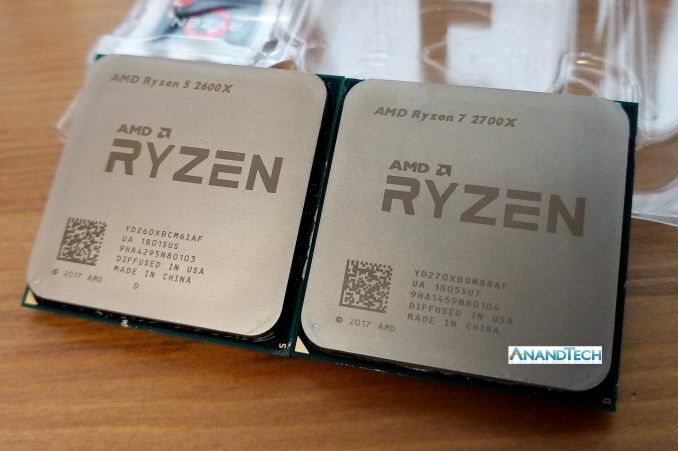 This is in contrast to when the Ryzen 1000-series was launched last year, when the octo-core Ryzen 7 1800X was compared against an 8-core Broadwell-E: in the interim Intel has updated its mainstream processor line to six-cores with high frequencies. It is easy for AMD to wave the multi-threaded crown with its internal testing, however the single thread performance is still a little behind. A number of the new features with the Ryzen 2000-series are designed to help this: slightly higher IPC, higher frequencies, a higher TDP, and a better dynamic frequency boost model. We will cover these over the next few pages. Frequencies and core counts are one part of the equation, though the way that AMD and Intel have different cache models will also play a significant part. One of the things we will see in this analysis is the comparative cache metrics, as well as the tuning AMD has done to close the gap. For pricing, AMD has put the Ryzen 7 2700X below the i7-8700K, as well as bundling the Wraith Prism RGB stock cooler which easily replaces any $30-40 cooler, saving the user some money. The Ryzen 5 2600X comparison with the Core i5-8600K is much closer than the higher-end parts. These components share core counts, although the Ryzen 5 has double the threads. For any multithreaded workload that can take advantage of simultaneous multithreading is likely to pull ahead. The Core i5-8600K is slightly ahead in core frequency, and is expected to have an IPC advantage as well. Again, AMD bundles the CPU with a good stock cooler, whereas Intel’s offering is poor-to-nil. Overall, AMD is claiming that its high-end processors will come in within 1-2% of the competition at 1440p gaming, but give +20% in ‘creative performance’. We’ve got a few ways to test this. Looks good, guess AMD will replace my Intel system next. I still haven't felt limited by my old 3930K yet. I never felt limited by my i5-4670k either, especially mildly overclocked to 4.0GHz. Until I build a new PC around the same old components because the MSI Z97 motherboard (thanks MSI) failed (it was 4 years old but still...) so I picked up a new i3-8350k + ASRock Z270 at Microcenter bundled together for $200 a month ago, and it's a joke how much faster it is than my old i5. First off, it's noticeably faster, at STOCK, than the max stable overclock I could get on my old i5. Granted I replaced the RAM too, but still 16GB, now PC4-2400 instead of PC3-2133. Doubt it makes a huge difference. Where things are noticeably faster comes down to boot times, app launches and gaming. All of this is on the same Intel SSD730 480GB SATA3 I've had for years. I didn't even do a fresh install, I just dropped it in and let Windows 10 rebuild the HAL, and reactivated with my product key. Even on paper, the 8th gen i3's are faster than previous gen i5's. The i3 stock is still faster than the 4th gen i5 mildly overclocked. i think there's something wrong with your old Haswell setup if the difference is that noticeable. I have every generation of Intel I7 or I5 except Coffee Lake running in 2 rooms attached to each other, and I can't even notice a significant difference from my SANDY 2600k system with a SATA 850 Evo Pro sitting literally right next to my Kaby I7 with a 960 EVO NVMe SSD. I want to convince myself how much better the newer one is, but it just isn't. And this is 5 generations apart for the CPU's/mobos and using one of the fastest SSD's ever made compared to a SATA drive, although about the fastest SATA drive there is. Coffee Lake is faster than Kaby but so tiny between the equivalent I7 to I7, I can't see myself noticing a major difference. In the same room across from these 2 is my first Ryzen build, the 1800X also with an 960 EVO SSD. Again, I can barely convince myself it's a different system than the Sandy 2600k with SATA SSD. I have your exact Haswell I5 too, and it feels fast as hell still. Especially for app launches and gaming. The only time I notice major differences between these systems is when I'm encoding videos or running synthetic benchmarks. Just for the thrill of a new flagship release I just ordered the 2700X too and it'll be sitting next to the 1800X for another side by side experience. It'll be fun to setup but I'm pretty convinced I won't be able to tell the 2 systems apart when not benchmarking.